Techline Furniture, Cabinetry & Closets offers design consultation, space planning, delivery, product move and re-install services throughout the Dallas/Fort Worth Metroplex. These businesses that are setting up shop into a relevant design space, will display how Techline can offer a custom design solution for any area of your house and business, from elaborate master closets and pantries to commercial workstations and business offices. Techline offers design consultation, space planning, delivery, product move and re-install services throughout the Dallas / Fort Worth Metroplex for residential and commercial clients. Admission is free and is open to the public, however attendees are encouraged to bring canned goods to support the Tarrant Area Food Bank as they prepare for a busy holiday season feeding those in need. There will be many gift giveaways from each of the local businesses participating. Anyone who attends gets one entry into the prize giveaway. Those that bring canned goods get two chances to win prizes! Active Spine & Sport Therapy will be moving into a commercial medical or business office space within Techline’s showroom providing consultation services and treatment options. A-Ward Custom Installations will be moving into a custom garage storage solution space discussing kitchen, bathroom and flooring solutions. Cookie Lee Independent Jewelry Consultant, Chrissy Green will be moving into a master closet displaying gorgeous items for sale. DFW Flowers will be moving into a custom designed craft center and providing many gorgeous arrangements available for purchase. Fort Worth Catering will be moving into a commercial workstation area and providing the tasty hors d’oeuvres for the evening. Halo Salon & Color Lab will be moving into another commercial workstation providing makeup services, analyzing hair and scalp with a capilliscope, and recommending various Phyto hair care products available for purchase. Entertainment will be provided by More Than Just Dance DJ. MPulsive Fashions by Melissa Nickelson will move into one of the amazing custom master closets showcasing beautiful fashions available for purchase. Red Jett Sweets mobile cupcakery will be displayed outside in the parking lot serving up delicious cupcakes. Roy Pope Grocery will be moving food items into the custom pantry area and is serving wine samples. State Farm Insurance Agents Kim Mader-Bagley and Craig Bagley will be moving into a commercial business office to answer questions about insurance policies. 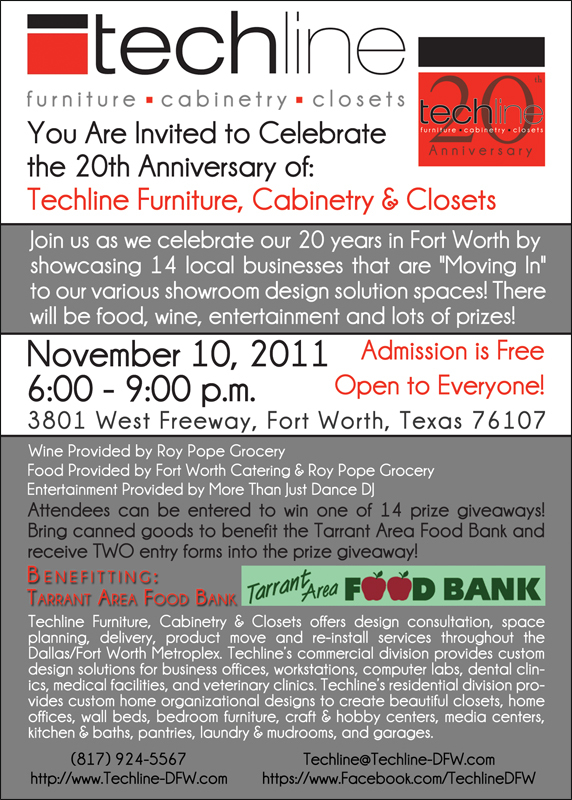 Tarrant Area Food Bank will be onsite collecting canned goods and discussing their community services. Wright At Home will be moving into a custom bedroom furniture and wall bed space providing beautiful home decor and bedding available for purchase. And of course, Techline’s sales team will be available to discuss residential and commercial design solutions. Active Spine & Sport Therapy is a progressive physical medicine and sports therapy center that treats musculoskeletal injuries from the feet to the head. Emphasizing individualized, rapid treatments to keep patients doing what they love, combined with detailed patient education to teach them to take care of themselves. For more information, call 817-332-5353 or visit http://www.activespineandsport.com. A-Ward Custom Installations is a family-owned service business serving the Dallas/Fort Worth Metroplex for over 30 years with a reputation for quality work and dependability. A-Ward transforms and beautifies floor areas with installation of ceramic tile, natural stone, such as travertine, marble, slate or granite, and hardwood floors. A-Ward installs kitchen and bathroom countertops, decorative backsplashes, and shower and bathtub surrounds complete with plumbing and new fixtures. For more information, call 817-654-0081 or visit http://www.awardcustominstallations.com. Cookie Lee Independent Consultant, Chrissy Green offers a wide variety of affordable, fun and fashionable jewelry. Cookie Lee jewelry is delivered directly to customers through shows, fundraisers and personal shopping and is sold exclusively by independent Consultants throughout the United States. With over 150 pieces of jewelry under $25 this season, they have something for everyone! For more information, call Chrissy at 817-675-7004, email cgreencookie@peoplepc.com, or view the corporate website http://www.cookielee.com. DFW Flowers has been providing flower and gift delivery to the Dallas/Fort Worth metroplex since 1971. DFWFlowers.com can create gorgeous flower arrangements for any occasion, offering a large variety of fresh flowers, plants and gifts. Specializing in weddings, corporate events and funerals, DFW Flowers’ team of artists delivers outstanding floral presentations. Stop by their two locations to place your order, call or enjoy the convenience of safe and secure ordering online 24 hours a day. Their goal is to exceed their customers’ expectations with quality, value and professional service. For more information, call 817-624-8413 or visit http://www.dfwflowers.com. Fort Worth Catering is a family owned, full-service custom caterer and has been catering corporate and private events in the metroplex for over 28 years. Besides winning several industry awards for excellence, Fort Worth Catering has established a metroplex-wide reputation for quality food and innovative presentation. They have the experience and the capacity to handle any type or size event — from an intimate wedding reception, a company training seminar, a casino-themed school reunion, or a company grand opening! For more information, call 817-714-0383 or visit http://www.fortworthcatering.com. Halo Salon & Color Lab is a progressive salon located in Fort Worth in the upscale The Village at Camp Bowie. Halo offers relaxing treatment experiences, beautiful color services, precision cuts and gorgeous finishes, hair extensions, and High Definition Airbrush Makeup, all performed by specialists, highly trained in their area of concentration. For more information, call 817-737-4256 or visit http://www.halocolorlab.com. More Than Just Dance DJ provides music and dance lessons for company functions, graduation celebrations, weddings, divorce parties, private parties, youth events, kick off events, birthdays, anniversary parties, and grand openings. For more information, call 817-542-5741 or visit http://sites.google.com/site/morethanjustdancedj. MPulsive is a high end fashion boutique by Melissa Nickelson providing a personal, one-on-one private shopping experience by appointment only. For more information, call 817-732-5267 or visit http://www.facebook.com/pages/MPulsive/165713603490852. Red Jett Sweets is a Mobile Cupcakery. Their sweet red cupcake truck is roaming the neighborhoods of Fort Worth loaded with oh-so-delicious cupcakes. It’s easy to find their current location and track their comings and goings via Twitter and Facebook! For more information, call 817-733-6422 or visit http://www.redjettsweets.com. Roy Pope Grocery serves their customers only the finest quality of products, providing the friendliest, fastest service, with no waiting. An asset to their neighborhood community that they have been serving for over 68 years. “We still do it right, the old-fashioned way.” For more information, call 817-732-2863 or visit http://www.roypopegrocery.com. State Farm Insurance Agents Kim Mader-Bagley and Craig Bagley is a second generation agency providing insurance and financial services for everything that’s important in your life. At the Mader-Bagley Insurance Agency, they spend time getting to know their clients so they can ensure their clients have the right amount of protection at the right cost. The agents provide personal and friendly service for everything that’s important in your life! For more information, call 817-594-0241 or visit http://www.mader-bagley.com. Tarrant Area Food Bank is a private 501(c)(3) not-for-profit serving Tarrant and 12 neighboring counties on the west side of the Dallas/Fort Worth (DFW) metropolitan area. Tarrant Area Food Bank is the distribution hub of a 13-county network of hunger-relief charities and social services centers. As a central clearinghouse for donated food and groceries, the Food Bank receives fresh, frozen and nonperishable food donated by the food industry and the community. They distribute this product from their 69,000 square-foot warehouse in Fort Worth to their 300 partner agencies that serve abuse victims, children, the elderly, the chronically ill, the unemployed, the working poor, the homeless and other Texans in need. For more information, call 817-332-9177 or visit http://www.tafb.org. Wright At Home is a unique fine gifts and home furnishings store located at 4818 Camp Bowie Blvd. Visit their shop to find unique home accessories, antiques, tableware, clocks, home fragrance, furniture, and fine bedding. Visit their new store called WRARE for a unique assortment of exclusive cards, gifts and home decor, located at 2955 Crockett Street. For more information, call 817-989-8222 or visit them on Facebook at http://www.facebook.com/WrightAtHomeFortWorth. Children are always evolving, growing, and changing their tastes. One minute dinosaurs are all the rage, the next it’s zebras. But one thing that will always be consistent is the skills they will learn about organization that will stay with them throughout the years. If you want your children to learn organization skills early, it helps to give them easy ways to do it. 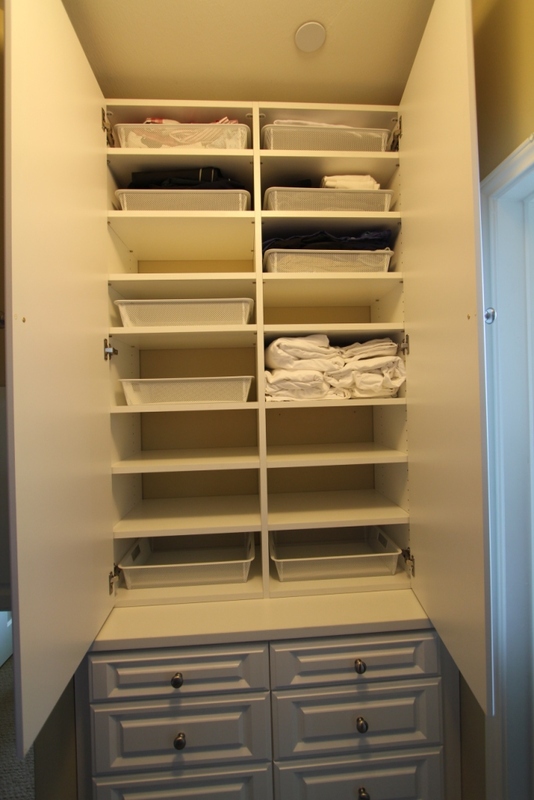 Things like multiple hanging heights with added shelves, drawers and baskets will accommodate diapers to denim! Use low shelving and labelled storage bins for all their toys and crafts. Under-the-bed storage drawers (especially those with wheels) are great for out-of-season clothes or treasured school/art papers. Don’t forget the valuable space behind doors, including the inside of the closet door. Using the backside of a door is a great way to store additional items while getting them out of sight. Shelf units designed for the pantry can work in the bedroom as a home for games and books. Multi-level closet rods are the only way to go in a child’s closet. You can empower your child to have more autonomy by giving him or her access to their own clothing. 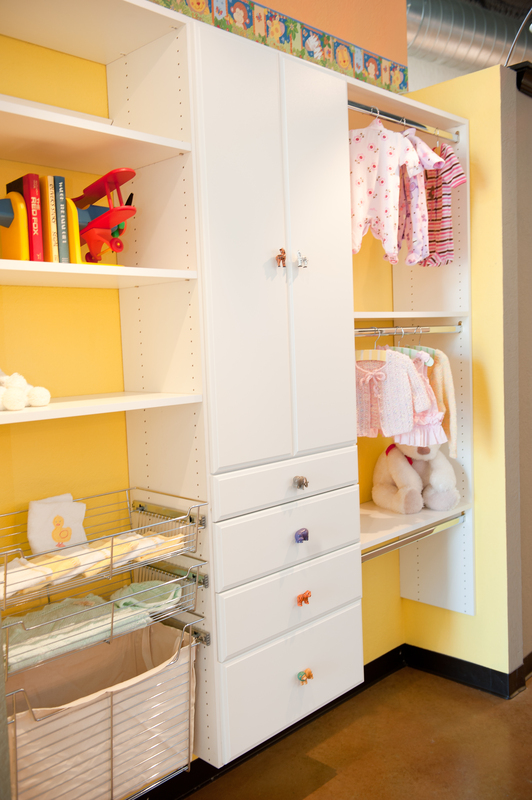 From infant to teen, Techline Furniture, Cabinetry, & Closet’s closet designers will maximize their closet space with an adjustable system that can change with them. For more information about Techline’s products and services, LIKE our Facebook page! 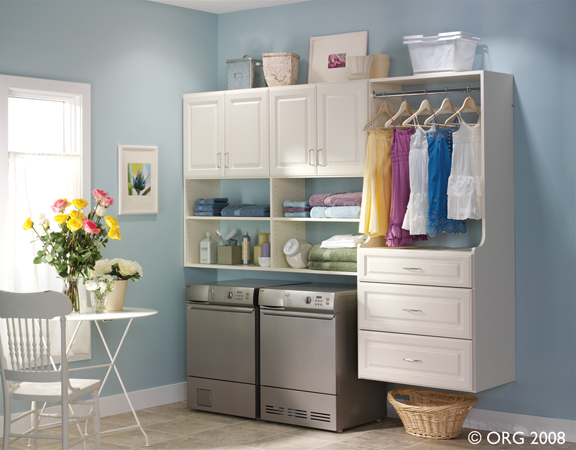 One very important room in your home you may not think too much about offhand is your laundry room! It could be the smallest room in your house, but it holds A LOT of importance! So why neglect it when organizing and planning your projects? Laundry rooms hold a variety of objects such as hats, gloves, not-in-season accessories, pet supplies, cleaning supplies, etc. The first step to organizing all of these is to clear the space and then group all like items together. You can step back and take a look at the items you use more than others. Those things that you never use anymore…throw them out! Items you most should be in the easy-to-reach places while items you still use, but not as much can be put on the higher shelves. Use storage baskets and pull-out hampers for sorting, cabinets and adjustable storage shelves for organizing, storage racks and rods for hanging clothes, and fold out ironing boards for convenience. Techline Furniture, Cabinetry, & Closets designers create organized systems to accommodate any space, any size washer and dryer, and any size family with style. 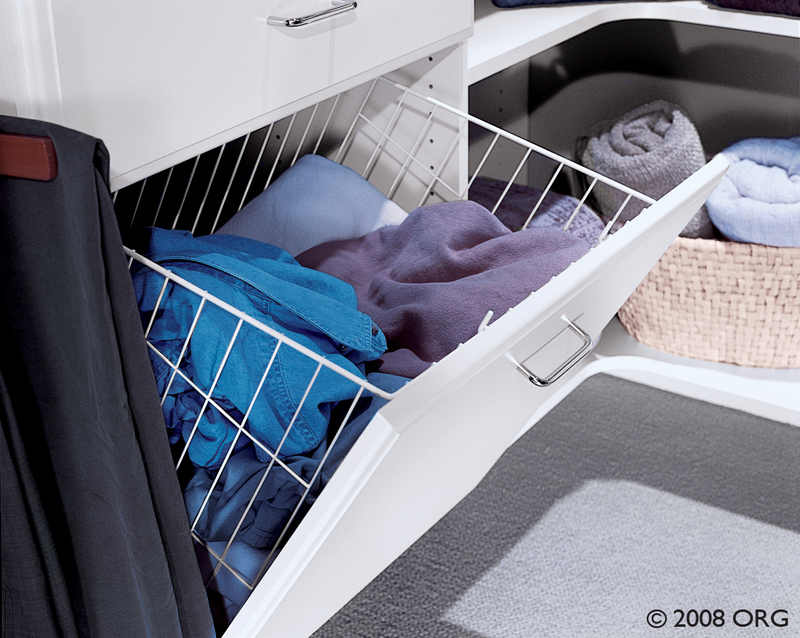 A Techline laundry storage system can handle loads! For more information about Techline’s products and services, see our Facebook page! Tackling your garage can seem a bit..overwhelming. It’s a large space that tends to accumulate the random pieces of your home that you don’t have any other place for. But the organizing process doesn’t have to be overwhelming. First thing first, Safety. Learn the best ways to store that hazardous stuff we all keep in the garage: the chemicals, the paint cans and pesticides. Always store such substances in their original containers and out of reach of children, on a high shelf or in a locked cabinet. Another concern is kids’ toys. They can be a hazard if they’re not stored properly. First of all, they should be kept well away from chemical clutter, and they should be up off the floor. Not too high, though; you don’t want the kids trying to reach them by standing on wobbly boxes. Use bins for small toys and balls. Ladders can be a hazard just leaning up against a wall. That may seem like the logical way to store a ladder, but it can tip over very easily, damaging your car or injuring a loved one. Lean it against the wall horizontally at floor level, or, even better, store it on hooks. Gardening tools should be stored vertically on secure hooks attached to the walls so they’re easy to get to when you need them and they’re out of the way when you don’t. It’s easy to control clutter if you remember that the four walls of your garage are actually four more floors. With the right shelves and hooks, you can actually quadruple your storage space! 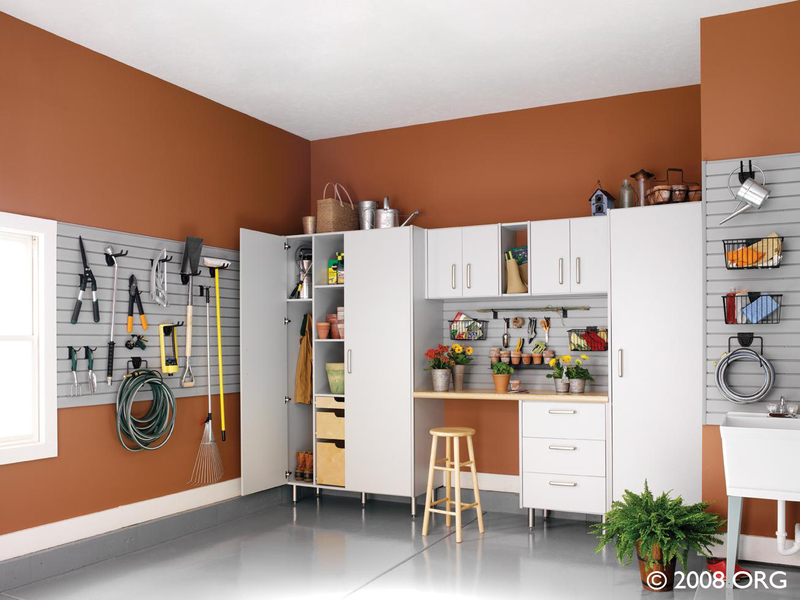 Techline Furniture, Cabinetry, & Closets‘ garage storage system can transform a messy garage into an organized, efficient space you’ll enjoy working in. From large cabinets and heavy-duty workbenches, to a decked-out organizational wall of tools, our home organization options are sure to fit your space, style and budget. Techline offers durable laminate finishes that compliment your environment. Create the garage you’ve dreamed of today by starting at our Facebook page! 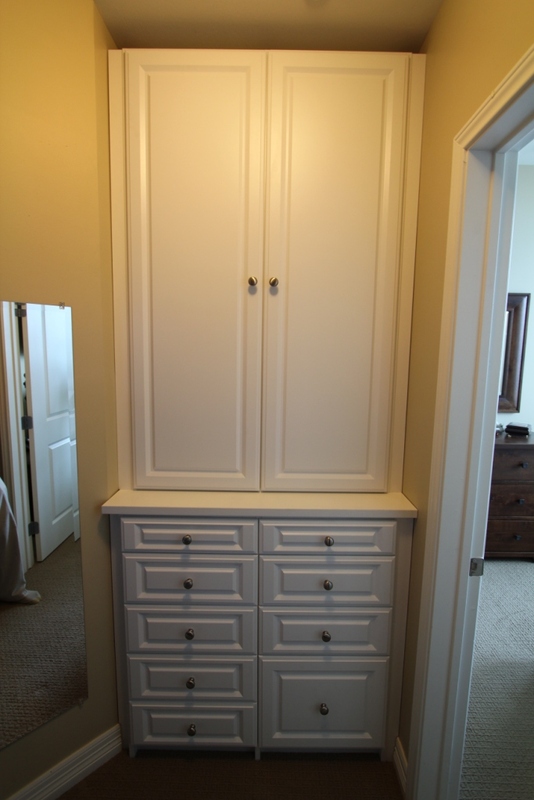 We know you love your master closet, but that doesn’t mean that every other closet in your home has to be ordinary. Whether it’s for storing clothes or other items, a walk in closet needs to be organized in order to make the most out of the space. Increase hanging space. Really utilize double rods to double that space. Take the time to separate jackets from shirts, jeans from dresses – keeping like things together will organize and shrink the space. Add accessible and adjustable shelving. These hide the things you don’t want to see and/or provide a home for those things that don’t seem to belong anywhere else. Not all closets have to hold clothes, so if you’re using yours to hold crafts, papers, etc., these shelves are perfect! Utilize drawers and baskets to conceal clutter. You can fit a ton more socks in one container, fold shirts, ties, pants, etc and save on hanging room! Have a child? These are perfect for clothes or toys more in reach. Let a Techline closet designer show you how you can create usable space you didn’t even know you had. 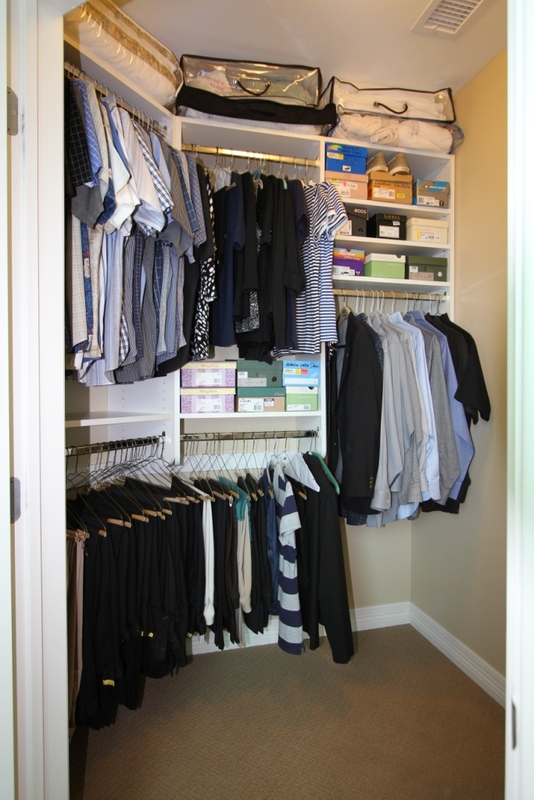 A closet system from Techline gives your walk-in closet definition and function beyond the basics. To see more about our products and services, visit our Facebook page! Like any room in your house, your bathroom should be spectacular and comfortable. It is a room you spend a lot of time in, so why not make it just as amazing as the rest of your home?! Clean out. Products, expired medicine/vitamins, used razors and beauty items you haven’t used in 6 months, throw it out! See what you have, don’t have, and what you use the most so you can start fresh. Organize. Small bathrooms are huge and some small, but they ALL could use some extra storage space for those random items you can’t live without. Organize items by importance – the things you use most, keep on the counter or close by; things you rarely use can go in drawers and closets. The less important the item, the further away from the counter it should be. Make use of that dead space. That space can be filled with floating shelves, cabinets, wall mounts, etc. Don’t want to buy jewelry stands? Use your towel rack to display it all! Be yourself! Add those quirky things that make you you. You’ll be spending the most time in there, so make it a place you WANT to be! Techline cabinets make any bath extraordinary! Our cabinetry is commercial-grade, precision made and designed to last as long as your home. Simple, classic door styles and finishes ensure that your bath remain timeless. 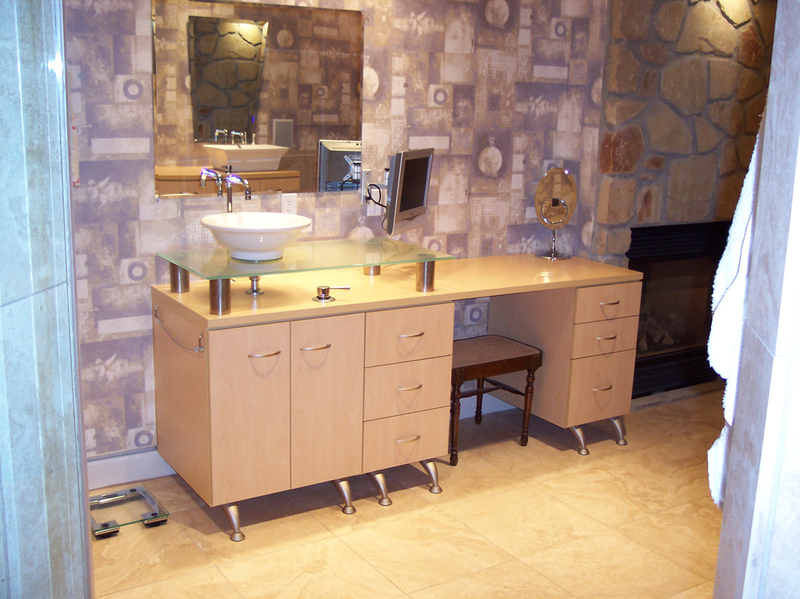 Whether your style is contemporary or traditional we will design your kitchen and bath to perfectly fit you. For more information about our products, see our Facebook page! You used to go out all of the time, but now you are a parent and it’s important to you that your family all sit down together for dinners. And with the extra family time comes all of the extra food! Where do you put it all? At Techline furniture, there are so many new devices and organizational tips that help to enhance our storage at home. From shelves, built-in glass and wine racks, hooks to hang linens, and drawers to store servers and silverware, all of these storage options help organize all of the knickknacks and small utensils. 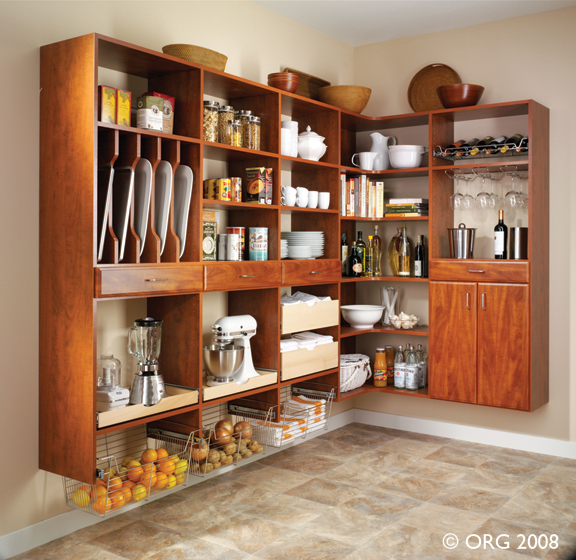 Adjustable storage shelves organize cookbooks, and boxed and canned goods, while storage cabinets close to conceal cleaners or large cookware. Clean everything out. This will allow you to see what all you have…and what multiples you have that you can get rid of. Put like things together. For example: put all spices in one area, canned foods in another, etc. Keep heavy items on the floor. Step back and admire your work. Every project, large and small, once completed is a great accomplishment! With an organized kitchen pantry, you see what you have so less food goes to waste which means fewer trips to the supermarket! Visit our showroom at 3801 West Freeway Fort Worth, TX 76107 or website to begin building and organizing your new technology today. For more tips, see our Facebook page!